Eat your heart out, Pollock! At every stage of life, nothing can quite soothe the soul and foster creativity and imagination like artistic expression. For children, this is especially true. Many therapists use art therapy as a means to understand someone who is too young to express him or herself with words. There is not one person who cannot create something in an artistic form, whether it’s with sketching, painting, sculpting, writing, poetry, music, singing, dance, or drama. I believe that parents who limit or neglect artistic expression in their homes are doing a huge disservice to their children. It’s not about talent. It’s about expressing oneself. Children often feel like they don’t have a voice in the world and art can help them speak. 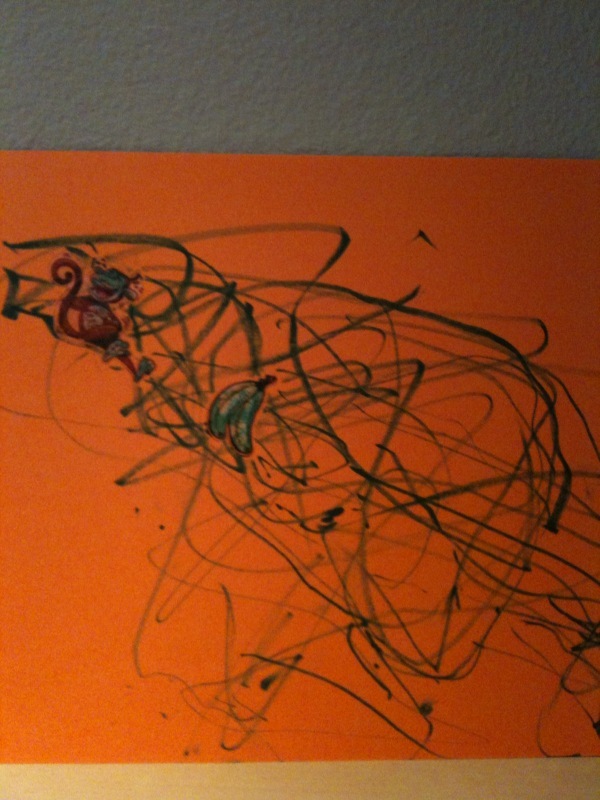 As a 24 month old toddler, this is the perfect time to introduce the Monkey to different art forms. The best way to do that is just let the little one create. I put some newspaper or a vinyl tablecloth down on my kitchen table and lay out different supplies. We use playdoh, clay, and a small amount of different uncooked pastas, which is a great way to introduce little ones to different textures and the art of sculpture. We will go outside and use chalk to graffiti our fences, driveway, and sidewalk. We use crayons, markers, and stickers to create masterpieces. 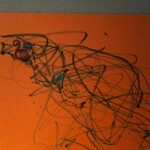 Like most children, the Monkey is really quite good at abstract expression. We’re working on portraits, but we’re not quite there yet. I want this print for my home. Is it inappropriate to decorate my son’s room with a Big Lebowski theme? Probably. I guess it’ll have to go in my hallway.